What does this mean? Well, we find this as a reminder that whatever problems you may be facing, you have the option to either be part of the problem or part of the solution. You can either sit there, pointing to the problems, and display negative energy OR you can take action, one step at a time, until you have overcome the hurdle. 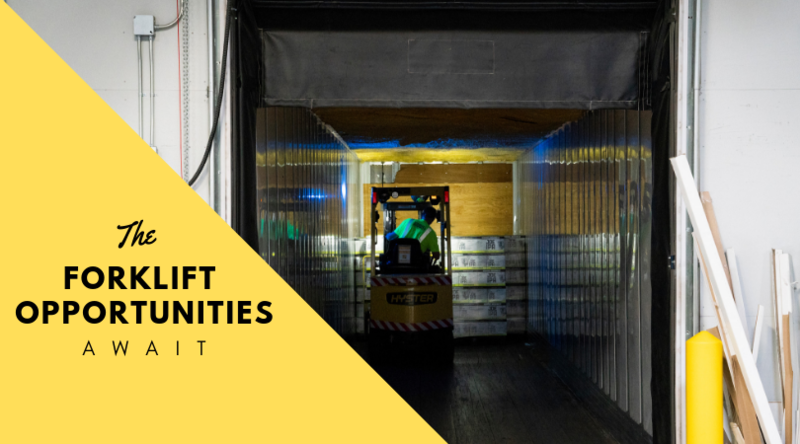 As a sought after forklift school, we have met many men and women who, prior to becoming one of our students and graduates, had their own obstacles, such as struggling to find work or landing a higher paying job. Not wanting to disappoint her son, Isabella knew she had to find a way to cover the added expenses. She had two options: She could have remained in her current position, complaining about the low pay and stressing out about the lack of income OR she could have done something about it. AND SHE DID! Uncovering that the forklift operators at her company were at the pay scale she was hoping to achieve, she decided to take the leap, become a forklift operator, and take advantage of the forklift opportunities available. As she said, “if the guys could do it, so could I.” But where was she going to start? What was she going to do? How was she going to find these forklift opportunities? Given that others in her company had obtained their forklift certification and forklift certification renewals from us, here at American Forklift Training Centers, INC, she gave us a call at (323) 620-7000 and came in the following day. New to forklifts, we walked Isabella with hands-on training, from beginning to end, on how to steer, maneuver, load, unload, stack, tier, equipment instrumentation, inspection, maintenance, and safety regulations. Our goal was to show Isabella that anyone, with proper training and encouraging instructions, can learn how to operate a forklift. Accordingly, we’re firm believers that with new students, any students for that matter, instructions must be thorough, yet simplified to quickly and easily understand. And guess what? We can confidently say, that upon Isabella’s completion of forklift training, she had our stamp of approval that she could safely and properly operate a forklift. After the one day course, Isabella was officially forklift certified and within a few weeks she landed a position at her company as the newest member of the forklift operation team…just in time for her son’s tuition. Her success doesn’t stop there…as more forklift opportunities were awaiting. As mentioned before, at our Commerce location alone, we’ve partnered up with over 100 companies and agencies to help graduates get a job. Upon completion, we forward graduates’ information to these hiring agencies and companies, bringing opportunities to them. It’s as if you have 100+ agencies in your back pocket whenever you want. Therefore, not only did Isabella land a higher paying job at her company, but she has been approached by numerous other companies as well, paying more and located closer to home. You see, all of this took place because Isabella took action. She didn’t allow herself to become part of her obstacles. She took one step after another, from deciding to become a forklift operator, to picking up the phone to call us and learn how, to taking the class, obtaining the higher position, and now receiving more and more forklift opportunities. It’s your turn…watch the forklift opportunities knock…call us at (323) 620-7000.